For a revealing Common Core Standards lesson “assessing” the historical value – or lack of it – of this painting, click here, and follow the links to see the whole lesson. On this Thanksgiving day, I’m thankful to God for His many blessings: His Love, Mercy, and Grace, and His Wonderful Gift of Salvation purchased by the shed Blood of Christ Jesus. America is in Grave Danger!!! I’m thankful for every American and Resident Alien who dons the gauntlet joining the Great Cause to Save America for the 21st Century, and Beyond – should the LORD tarry. All-over America, voices are calling our Fellow-Americans to study and learn the true foundation of America and of our United States Constitution. I’m thankful that every day alarming facts escape the Mainstream Media’s Truth Blockade and the true state of Our Nation under God emerges. Americans must first learn what is really happening before being moved to act. We only know the tip of the ICEBERG and cannot even imagine what we don’t know, yet. From the man occupying the Office of President of the United States who lies whenever it suits his collectivist/progressive agenda – among which the ObamaCare lies cannot be denied – to all the machinations of those furiously helping him build the control structure for tyranny. As they try to get as much done as possible in fundamentally transforming America before enough Americans wake to the truth. I’m thankful that the country is finally hearing the horrifying truth about Black American Youths “playing” the “Knock-out Game,” in brazen assaults on innocent, unsuspecting Americans of “other races.” If these facts along with the truth about Benghazi, Fast and Furious, six-month-long negotiations leading to capitulation to Iran’s nuclear weapons program, and many other acts are hidden from We the People, what else are they hiding, with the Media’s complicity? blinded by ignorance and lies! God is waking the Nation! I’m thankful for all who stand and speak for Our Liberty under God, in whatever way they are able. I’m thankful for the United States of America!!! Since the settlement of the colonies, Americans were familiar with setting aside days of thanksgiving, prayer, and fasting in response to significant events. . . .
. . . . In 1789, Representative Elias Boudinot from New Jersey presented a resolution requesting that Congress persuade the now-President Washington to declare a thanksgiving observance in honor of the creation of the new United State Constitution. 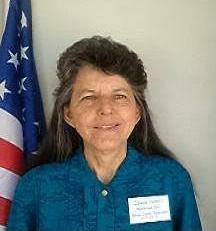 Congress agreed and passed the resolution creating a joint committee to make their request to the president. That is the issue that will continue in this country when these poor tongues of Judge Douglas and myself shall be silent. It is the eternal struggle between these two principles — right and wrong — throughout the world. They are the two principles that have stood face to face from the beginning of time, and will ever continue to struggle. The one is the common right of humanity and the other the divine right of kings. –October 15, 1858 Lincoln/Douglas Debate at Alton, Illinois. For seventy-five years after President Lincoln issued his 1863 Thanksgiving Proclamation for the “last Thursday in November,” all but two succeeding presidents honored the tradition established by President Washington. In 1865 and 1869, Presidents Johnson and Grant, respectively, chose a different Thursday. After that, every other president annually issued a Thanksgiving Proclamation, keeping with the last Thursday in November as the date. Keep in mind that the dating was a tradition, as was the Thanksgiving proclamation itself, in fact, and not a legal obligation by the president. Still, for a very long time the last Thursday had been proclaimed, and over time it bec[ame] an accepted fact to most. . . .
America observed Thanksgiving Day on the last Thursday in November until 1939. Collectivist/Progressive President Franklin D. Roosevelt, viewing Thanksgiving only through his control mentality, was concerned for the economic aspects of the approaching Christmas shopping season. He disregarded the true foundation and purpose of Thanksgiving in America: We the People, together as a nation observing a day set-aside to remember God’s Blessings and Providence and to offer Him our solemn thanksgiving. Roosevelt agreed with retailers who thought Thanksgiving falling on the last day of the month before Christmas would cause the economy to suffer. His Proclamation on October 31, moved it a week to the second-to-last Thursday in November – too short notice for Americans to spread the word, change plans and complete preparations across-the-country. He and his economic advisors apparently either had no regard for the ripple-effects of his untimely declaration, or were ignorant of the Big Picture; as is the normal state of most collectivists. Given their track record throughout the Great Depression of failed social and economic engineering, it isn’t surprising that the upheaval was for nought! The extra shopping days did not boost sales! For details of the confusion and division that ensued from this example of FDR’s attempts at “social and economic engineering”, also see the article referenced above, here. 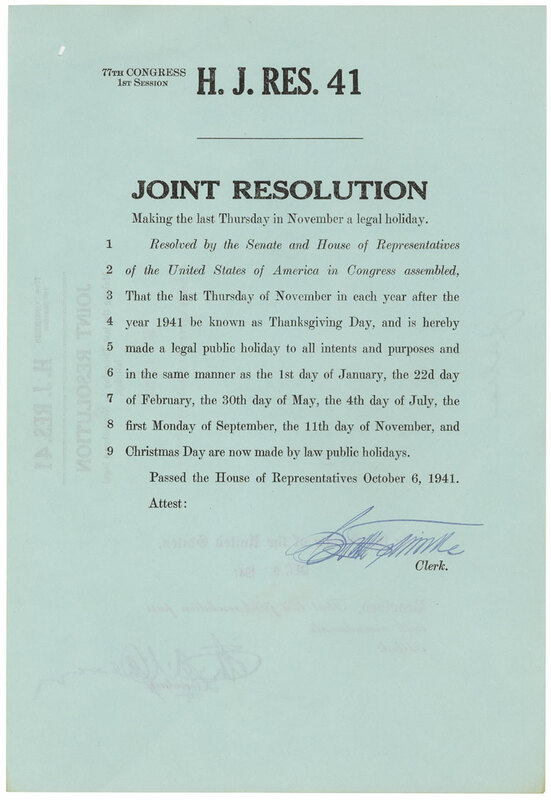 The national dispute culminated two years later, when Congress passed the following joint resolution, as amended by the Senate (copy follows, below), establishing Thanksgiving Day as the fourth Thursday in November – avoiding the occasional fifth Thursday in the month – and giving it new legal status as a Federal Holiday. 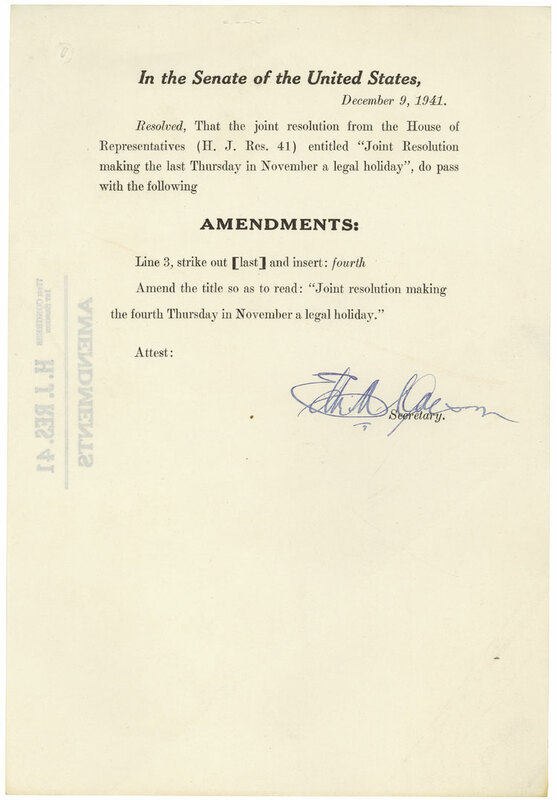 The president signed it into law on December 26, 1941. This entry was posted in Collectivism Progressivism, HOPE Rises, Memorable Days, One Nation Under God and tagged Abraham Lincoln Thanksgiving Proclamation, FDR, Franklin D Roosevelt Thanksgiving Proclamation, George Washington Thanksgiving Proclamation, Thanksgiving Day, The First Thanksgiving on November 30, 2013 by Itasca Small.